Let’s say that during this year 2018, we kicked up a lot of dust. And now, as it is settling, we have some time to reflect on the year and think about our role going forward. A small group of advocates at the Healthy Latin America Coalition and CLAS agreed early in 2018 to embark on an effort to have as great an impact as possible on the September 2018 UN High-Level Meeting on NCDs (HLM). We developed a Manifesto to sign up organisations and people who would request commitment from their Heads of State. We agreed to have a presence at the Summit of the Americas in Lima, Peru, which all presidents from the region would supposedly attend. CLAS Communications, with top communications experts, was set up to advance media actions in line with the NCD Alliance ENOUGH campaign. We agreed to be part of the Interactive Civil Society Forum at the UN in June, where I had the honour of speaking on the contribution of mayors and cities, and we developed a document with “Recommendations for policy action” in Latin America. CLAS was represented in the WHO Civil Society Working Group that contributed to the HLM, also giving us a chance to watch the grinding of the gears that produce an HLM at the UN. And we worked with the Pan American Health Organization to inform and get commitments from UN Ambassadors from the region. While only a handful of people from Latin America were able to attend the HLM, there was palpable excitement. Part of it was just being in New York in the rain, as it rained almost every day. It took great effort effort just to get passes to the UN building, go through security, and find the hotels where the side-events took place to keep us awake. A lot of coffee certainly helped. At the HLM, we heard many presentations from high-level authorities from many countries and sectors. But the most fun was to hear civil society advocates use the little time we had for interventions to forcefully speak with great courage about the urgency of dealing with NCDs. However, while the HLM did not take us backward, it did not help us advance much. Some countries managed to keep the Political Declaration almost toothless. How is it possible that the next stocktaking by the UN will not happen till 2025? I had hoped we would see major results in my lifetime—or in Mayor Bloomberg’s lifetime. And how is it possible that the Document managed to ignore the WHO Best Buys and that little was said about serious accountability? A few countries, reflecting the undue influence of the unhealthy products industries, kept the rest of the world from moving more rapidly towards health and sustainable economic development. The Summit of the Americas, whose theme was corruption, helped us frame our NCD narrative in terms of the disastrous impact of commercial interests on public health policy development. Who do we care about anyway? Your family, your grandmother? Or more profits for a few transnationals? Where do those revenues go anyway? I am passionate about the region of Latin America and what it can do to advance and contribute to the rest of the world. This region has some governments that are highly committed to health, economic development and equity. And it has some of the most courageous advocates. 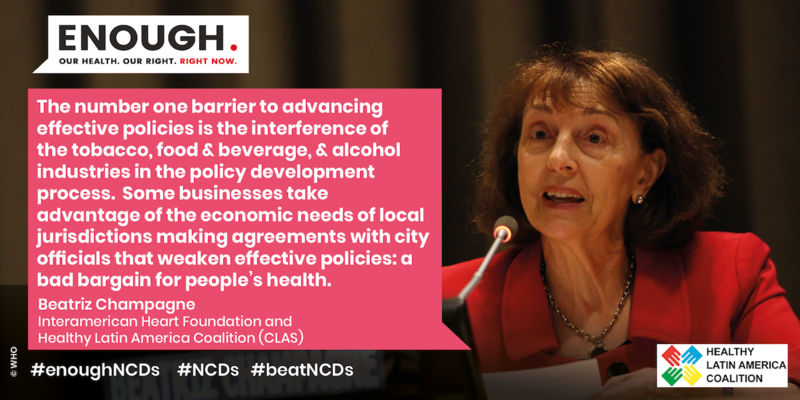 Despite these hard-won advances, the magnitude of the problem of NCDs requires a persistent and consistent effort in all countries to apply specific, cost-effective measures, in the face of powerful headwinds from the unhealthy products industry. Around 25% of Latin America’s population, 145 million people, are smokers, and an additional 20%, or 139 million, are obese or overweight. This is indeed the moment to act. And it is not the moment to be timid. Beatriz Marcet Champagne is the Director of Advocacy for the InterAmerican Heart Foundation (@IAHFnews) and Coordinator of the Healthy Latin America Coalition - CLAS (@CLASenLA). She is dedicated to the prevention and control of NCDs, heart diseases and stroke in the Americas. She helped found her organisation and was Executive Director from 1995 to 2017. She continues her active engagement with a focus on advocacy.